These gluten free mint sugar cookies are a family favorite that would be the hit of any cookie exchange party this holiday season. You get a bonus with these cookies too! Gooey Peppermint Patties are melted into each cookie. It seems like the holidays are coming faster and faster every year. We just finished Halloween, and Thanksgiving is right around the corner. Then the race is on for Hanukkah and Christmas. Stores are already putting up their Christmas decorations! Before our family had to go gluten free, we used to participate in cookie exchanges around the holidays. Each mom would spend weeks trying to come up with the perfect cookie to make for this event. I remember cookies I had made, chocolate chip, candy cane shaped striped cookies, cookies with frosting, cookie bars, it was always so much fun to try to top what I made the year before. And then the fun part…the get-together. The kids would be so excited for this day. They would wake up and jump out of bed ready to go see their friends and eat cookies :-). It was pretty cute. Everyone who attended would come home with a huge full plate of cookies. I loved this. Cookie exchanges are the best way to get so many different types of cookies without having to make so many varieties yourself. And time with friends? Now that our family is all gluten free, we don’t participate in cookie exchanges anymore. The risk of cross-contamination is too high. We do have a few friends who are gluten free, so it may be a great time for me to organize our own gluten free cookie exchange party :-). 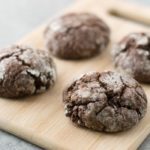 What Gluten Free Flour Is Best For This Gluten Free Cookie Recipe? I use several different gluten free flour blends when I bake. TIP: Do NOT use a gluten free flour blend with bean flours. It will leave a bad aftertaste in your sweets. Also, if the gluten free flour blend you use doesn’t contain Xanthan Gum, add 1 teaspoon. Xanthan Gum (or Guar Gum) help hold the gluten free baked goods together. One thing I discovered baking gluten free is you have to be really careful with your gluten free flour blend. Some work and some just don’t in certain recipes. It is like a chemistry experiment every time you bake. Put dry ingredients into a large bowl and whisk to blend. In a smaller bowl, add all wet ingredients and whisk. Mix the wet and dry ingredients in a large bowl. Use a cookie scoop to drop balls of dough on a cookie sheet. Press down slightly to flatten. Top with 1/4 of a peppermint patty and holiday sprinkles and bake. Can you freeze these gluten free mint cookies? You definitely can freeze these cookies! I like to double the recipe and freeze some dough for baking later. You can also chill this dough and roll it out to use cookie cutters. Can you use this gluten free sugar cookie recipe with cookie cutters to shape cookies? You can use this recipe with cookie cutters, but you need to reduce the amount of butter by 1 tablespoon. Also, you will need to refrigerate the dough before rolling it for 2 hours. My favorite cookie scoop. This is what makes your cookies all uniformly sized. These bowls don’t slide around when you are mixing up your ingredients….it makes it easier for my kids to do stir for me. 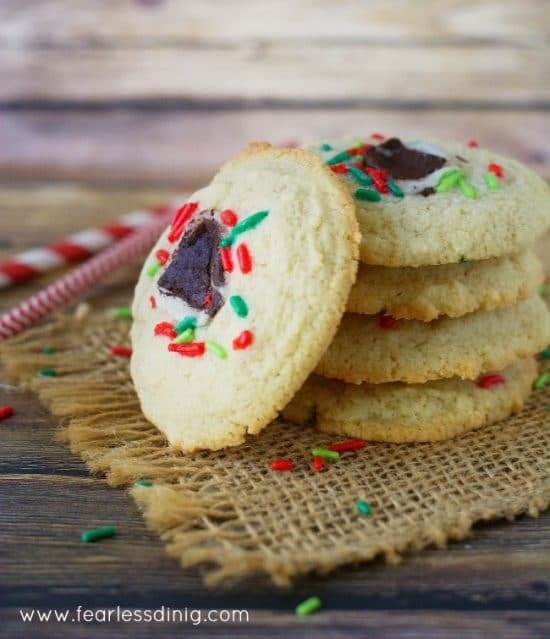 Easy, peppermint gluten free sugar cookie recipe. In a small bowl, add all wet ingredients and mix well. Pour wet ingredients into dry ingredients and mix. Use a cookie scoop to drop dough balls onto a baking sheet. Flatten slightly with your hand. Press 1/4 of a peppermint patty into the top and then add holiday sprinkles. Bake 8 minutes until done. Remove from baking sheet onto a cooling rack. More Yummy Gluten Free Cookie Recipes To Try! These cookies look so pretty and yummy… perfect for the holiday season. Thanks for sharing… saving the recipe. I never would have thought to add peppermint patties before baking. These cookies look awesome! OMG, I can’t believe you actually talked about starting a GF cookie exchange in this post. We must have some sort of mind-meld going. I didn’t read the post until just now and my jaw nearly dropped! I guess that’s a sign. Let’s do it!! I think it would be so nice to be able to enjoy cookies that we know are safe. I just can’t get enough mint! Thanks for adding another mint recipe for the holidays! I also used to love cookies exchanges. I still bake my gluten free cookies to share but won’t take any of the beautiful cookies home, just not worth the risk of getting sick. I would grab your pretty cookies in a heartbeat. I love mint in just about anything! Perfect! Mint is the best and such a great flavor of the season!